Holy Saturday in San Miguel is mostly quiet as the city waits for the joy of the Resurrection on Easter Sunday, when the events of Holy Week will come to an end. 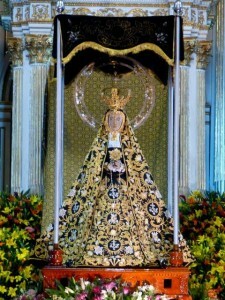 This quiet day is the feast of Our Lady of Solitude, a patroness of San Miguel since 1555. Our Lady of Solitude is more closely tied to Oaxaca for in the 17th century an unattended, heavily-laden pack donkey staggered into Oaxaca and died. No one knew where it had come from, who owned it, or what it carried. When the people examined his pack, they found a beautiful statue of Our Lady of Solitude. She wore a crown of diamonds with a huge drop pearl in the middle, and a black velvet robe with semi-precious stones. The people decided that as the donkey had died at that spot, they would build a basilica there to house the little statue. Historically no mass or communion is offered on this day unless the person is near death. Then the only hosts available are at the Nun’s Church with the cloistered sisters. Instead wakes (Pesames) are held in the churches with rosaries being recited to ease Mary’s pain while keeping her company. The first public plaza in San Miguel, where Allende rides astride his horse in a large statue, was named for Our Lady of Solitude and her image will be carried around it Saturday night. 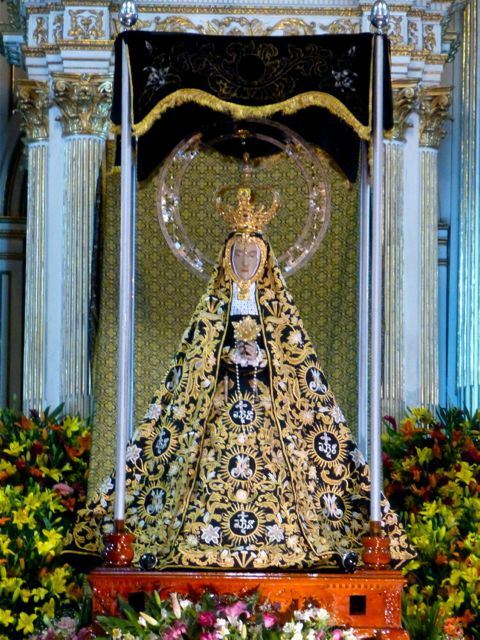 Also the Parroquia hosts a procession of the tearful image of Mary alone, crying and dressed in mourning colors of purple and black.